Isabella d’Este, who was a leading cultural and political figure during the Renaissance, died on this day in 1539 in Mantua. She had been a patron of the arts, a leader of fashion, a politically astute ruler and a diplomat. Such was her influence that she was once described as ‘the First Lady of the world’. Her life is documented by her correspondence, which is still archived in Mantua. She received about 28,000 letters and wrote about 12,000. More than 2000 of her letters have survived. Isabella grew up in a cultured family in the city of Ferrara. Her father was Ercole I d’Este, Duke of Ferrara, and her mother was Eleanor of Naples. She received a classical education and had opportunities to meet famous scholars and artists. She was reputed to have frequently discussed the classics and affairs of state with ambassadors who came to the court. When Isabella was just six years old she was betrothed to Francesco, the heir to the Marquess of Mantua. At the age of 15 she married him by proxy. He had succeeded his father and become Francesco II and she became his Marchioness. In 1493 Isabella gave birth to a daughter, Eleonora, the first of her eight children. About 12 years into her marriage, Lucrezia Borgia, who had married Isabella’s brother, Alfonso, became the mistress of Isabella’s husband, Francesco, yet Isabella continued to bear Francesco’s children throughout their long affair. After Francesco was captured during battle in 1509 and held hostage in Venice, Isabella took control of Mantua’s forces and held off the invaders until his release in 1512. She was hostess at the Congress of Mantua, held to settle questions concerning Florence and Milan. 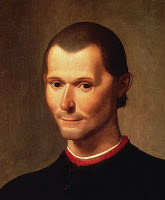 Francesco was said to have been humiliated by his wife’s superior political ability and their marriage broke down. After Francesco's death, Isabella ruled Mantua as regent for her son, Federico II. She played a part in getting Mantua promoted to a Duchy, had another son, Ercole, made a Cardinal and negotiated skilfully with Cesare Borgia. Many of the famous artists of the time worked for her, most notably Giovanni Bellini, Giorgione, Leonardo da Vinci, Andrea Mantegna, Raphael, Titian and Michelangelo. She was in contact with many writers, including Ludovico Ariosto, Pietro Bembo and Baldassare Castiglione. She sponsored musicians and employed woman as professional singers at her court. Isabella’s style of dressing, wearing caps and displaying plunging décolletage, was imitated throughout Italy and at the French court. She worked hard as a devoted head of state following the principles in Niccolò Machiavelli’s book, The Prince, and was respected by the people of Mantua. 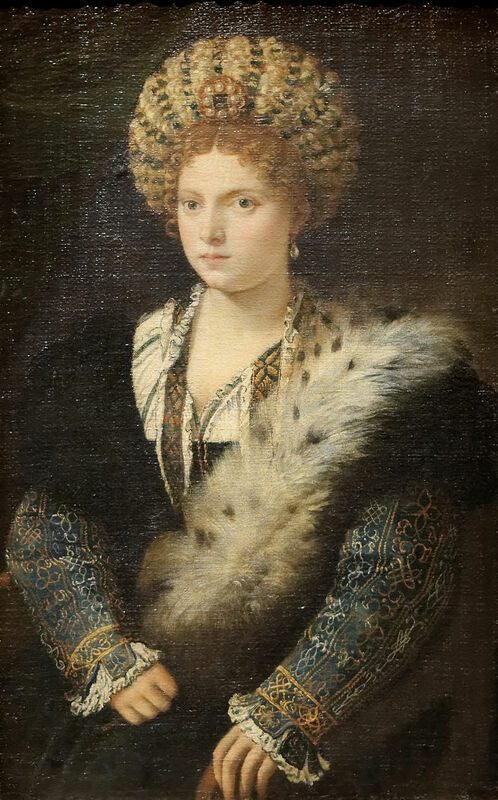 In retirement, she made Mantua a centre for culture, started a school for girls and turned her apartments into a museum containing the finest art treasures. When she was in her mid-sixties she returned to political life and ruled Solarolo in the Romagna until her death at the age of 64. She was buried with her husband, Francesco II, in the Gonzaga Pantheon in the Church of Santa Paola in Mantua. It is possible to view Isabella d’Este’s letters, which are preserved in digital format, at the Archivio di Stato di Mantova in Via Robertó Ardigo, Mantua. The building, previously a Jesuit convent, also houses the Gonzaga archive, which is one of the most complete archives belonging to a family that has governed in the modern age, and the Castiglioni archive acquired by the descendants of Baldassare Castiglione, including parchments, maps, drawings and documentation of the noble Mantuan family from the 13th to the 20th century. 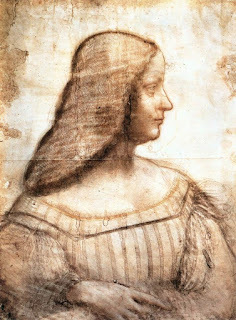 For more information on the Isabella d’Este Archive visit www.archiviodistatomantova.beniculturali.it. The 14th century Church of Santa Paola in Mantua, where Isabella d’Este was buried is in Piazza Quazza Romolo. 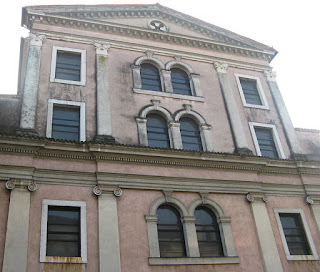 The church and adjoining monastery were built according to the wishes of Paola Malatesta, wife of Gianfresco Gonzaga, to accommodate a group of Poor Clares. Isabella and Francesco’s daughter, Livia, who became prioress there, commissioned frescos for the interior after her mother’s burial. Giulio Romano later painted scenes for the funeral of Isabella’s son, Federico II, of which some traces remain.